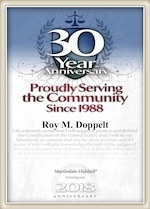 Trust the San Diego divorce attorneys at The Law Office of Doppelt and Forney, APLC to help you through your divorce, legal separation or paternity case. We offer all potential new clients a free 30 minute consultation directly with an attorney. It’s hard to forget Kim Kardashian’s short-lived 72 day marriage to basketball player Kris Humphries. On August 20, 2011, the couple married in California, an affair that was filmed and broadcast as a four-hour special on E!. After only 72 days of marriage, Kim Kardashian filed for divorce. In response, Humphries filed for annulment, claiming the marriage was a fraud – accusing Kim of marrying him in an attempt to boost ratings. For over a year, the pair was not able to settle what should have been a quick and easy divorce. There was a prenup in place, and the marriage was extremely short. Finally, after almost a year and a half since Kardashian filed for divorce, the two had reached a settlement and a divorce was granted (not an annulment). The short marriage and long, drawn out divorce catapulted Humphries into the spotlight. He was “that guy” people hated just to hate. In a new essay by Kris Humphries titled “I Never Wanted to Be That Guy”, Kris talks about his childhood, his basketball career, and of course, his relationship to Kim Kardashian. During that time, Kris describes the struggle he went through during that time. He recalled people booing him during basketball games and in general, hating him for no reason. He said, “Honestly, the game was the only thing that got me through it. The game and my family”. Do you need assistance with your legal separation or divorce case? Don’t wait, hire a lawyer you can trust to protect your rights. Call now at 800-769-4748 to schedule your free consultation with a seasoned family law attorney. We proudly serve clients in San Diego and surrounding communities, including Chula Vista, Coronado, Carlsbad, Encinitas, La Jolla, Oceanside, Ramona, San Marcos and Vista.